From this post I’m trying to compare few products in the market for remote desktop printing. It is not deep technical comparison, only the overview comparison of products and its usefulness in remote desktop services. Why the need of a Printing solution for Remote desktop services. Remote desktop and VDI solutions are becoming popular because the ability to centrally manage an end user and it’s cheaper than managing an individual PC. These are session based solutions, which is a central server environment provide sessions or an OS Image presented to the client through the network. Because the sessions are in a remote location, accessing local resources such as printers, scanners and audio devices are challenging. As I discussed in Remote desktop printer redirection article Microsoft Remote Desktop Terminal services use Printer redirection to run print jobs from the terminal sessions. But to get a real time accurate print jobs, you have to install the local printer driver to the session host or VDI host server. This will work on small organizations having only one or two printers. But with the companies that having many different printers, it’s a really difficult. Also as I explained in my previous blog post of Remote desktop printer spooler crash article, printer spoolers tend to crash with some printer drivers. So if you are having these problems and need to find a permanent solution for printing, you have to go with a printing solution. There are many products in the market to support remote printing. But not all are good for the job. I have organized few things that you may have to consider when selecting a product. How easy to install, if the product have many roles and need planning, it will take long time not so easy. Product should be easy to manage, if the product is having many roles that need to manage it will be another administrative task. Cost is really important when selecting the product. In the market there are products that is having so many features. some are important but most of these features are nice to have or irrelevant. So paying big money for them will get no use. So select the worthy product that matches you requirement. Any additional hardware or software requirement. If the product need additional servers such as print servers it will cost you more, and you will have a complex environment. Most of the time you will be using this kind of a product first time, so it’s nice if you can try it before purchasing. Then you can get the idea of the product very well. Test the following features. Feature comparison with Popular Remote Printing products. 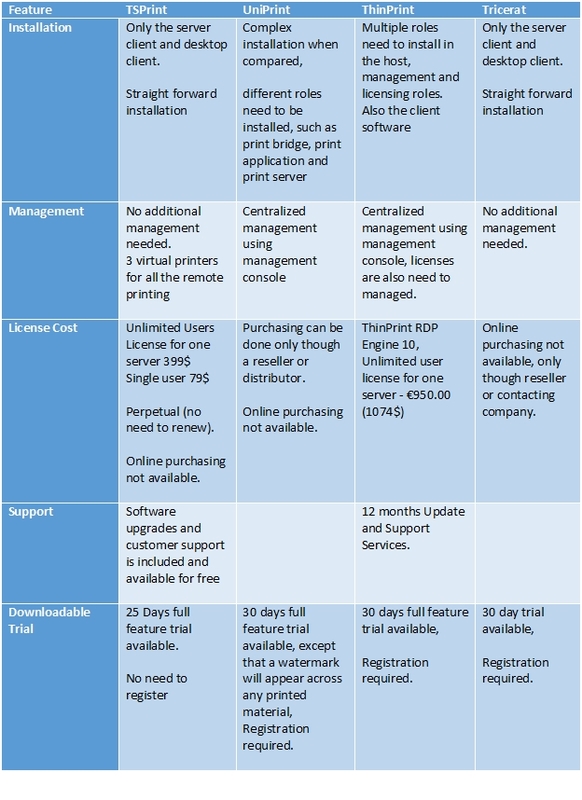 This comparison is based on how the products support in remote desktop and VDI printing. Support of mobile devices and other solutions were not considered. Following table compare popular printing tools (TSPrint vs ThinPrint Vs Unirpint Vs ScrewDrivers) and all information for this comparison based on product articles found in product websites and this product features may be changed or updated over the time. I haven’t had chance to test all the products. But I have installed TSPrint from terminal works and see how it works. It was easy to download and no need to register myself. Also it is a straight forward installation. Only two clients, server client need to install in the Remote desktop session host, workstation client to install in each RDS client. And that’s it, no more configurations. I have tested with different print jobs from RDP Client, all are accurate and output was in real time. Other products should also work fine but cannot give a comment without checking them first. So if you are going for a product just download the trial version and install to test it. Consider the product options that I have stated when selecting a remote print product. Please note: I have used product web sites and Youtube videos which is free available in the internet to get information for this post. Some information such as pricing and features of the products may be updated or changed with the time. 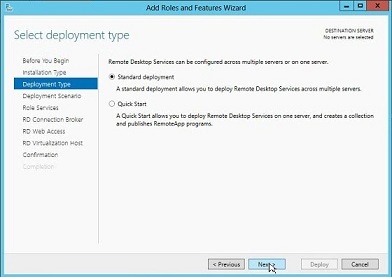 I have created Remote app Hybrid configurations in Azure, My remote app environment connecting with the azure VM network. So I have implemented VNET to VNET connection with my azure virtual network and remote app virtual network. And I have uploaded my Customize Template image to the remote app. But the issue comes when I’m trying to create the remote app collection. It giving the following error. ERROR – Could not provision the RemoteApp collection. Error: DNS server could not be reached. This is a common error to many remote app users, and there are many blogs saying to add google DNS to the Virtual network of remote app. I have tried this, and it make me to recreate the VNET to VNET. But it didn’t helped me. 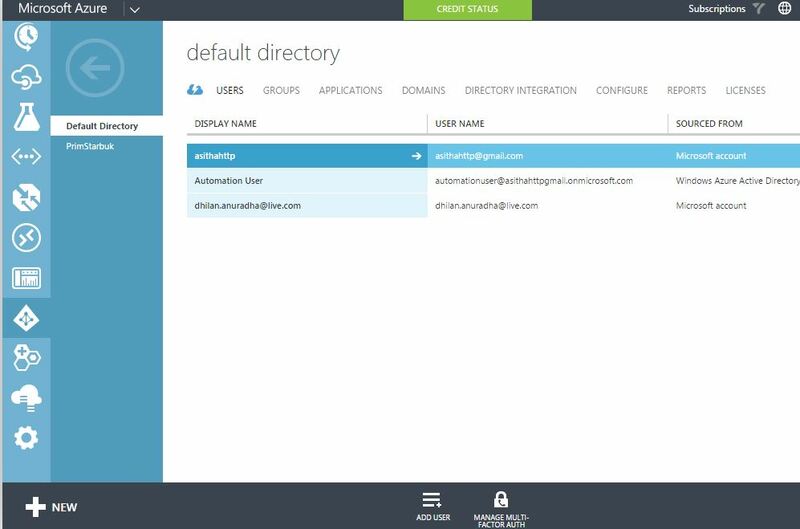 So I started troubleshooting and found this Remote app machine is added to the Active directory, I used that computer account name and remote desktop to that using my DC in azure VM. After connected to this VM, I have added google DNS (8.8.8.8) to this remote app VM by changing the network adapter properties. Use this method if you got in to this trouble. 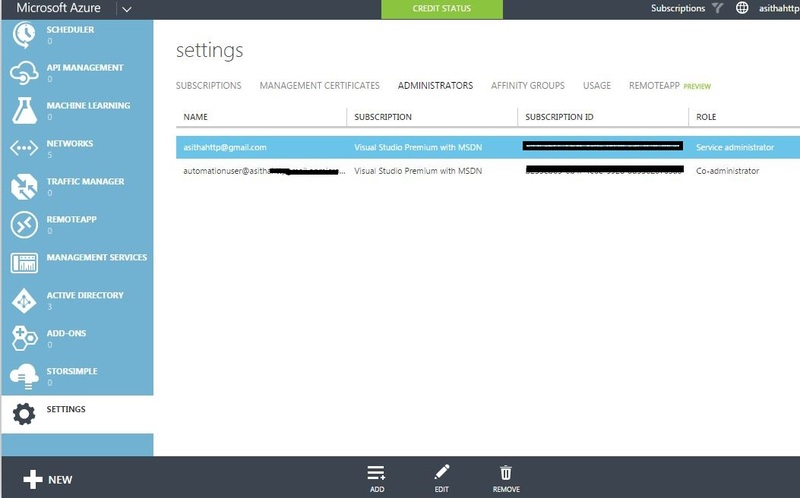 Azure automation is a cool feature that can use to automate the creation, monitoring, deployment and management of cloud resources in your Microsoft Azure subscription using a highly-available workflow execution engine. It’s a really cool feature, but when it’s first released, all the PowerShell run books have to use the certificate based authentication. And there should be a separate run book required to publish to access this certificate based authentication. 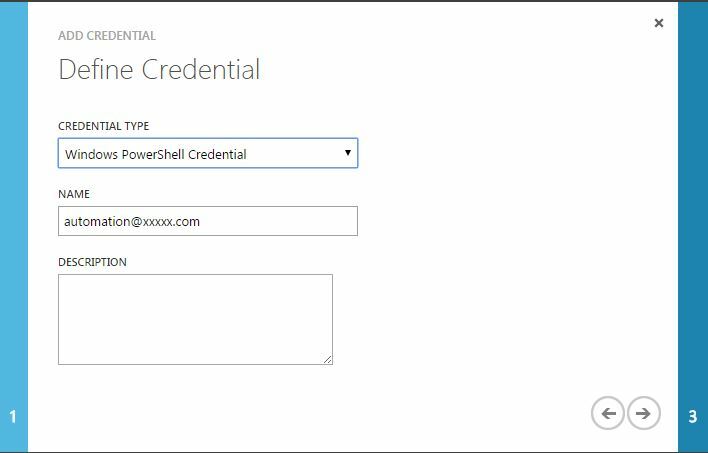 But with new updated azure automation, its support PowerShell credential based authentication, which will enable to write PowerShell run books much easier. This article describe how to automate the VM start and stop (deallocation) using PowerShell run books by credential level authentication. 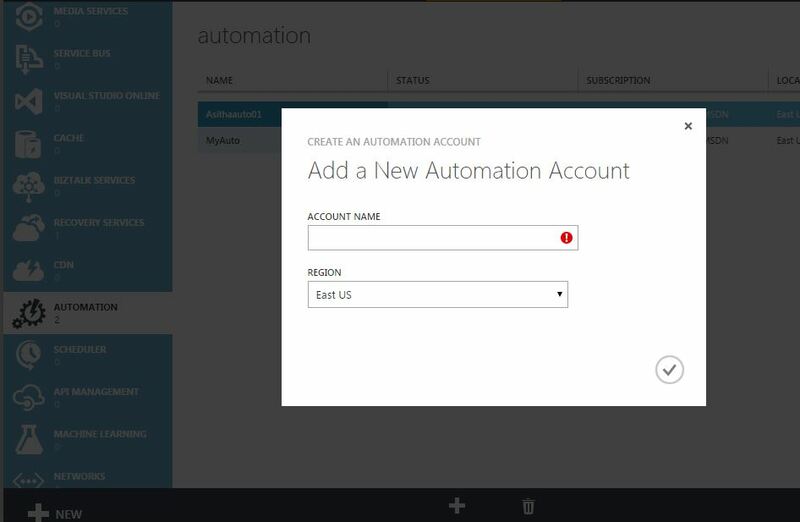 Create an Azure Administrator account in the Azure active directory to run Azure automation run books. Click the plus sign to create a new automation account. Click add settings and select ADD credentials. Create VM start Run Book. Automation – runbook – quick create, give the runbook name as VM start. In automation ps credential name, type the account name that defined earlier. AzureVM – name , is the VM name. Click Test to run the Runbook. 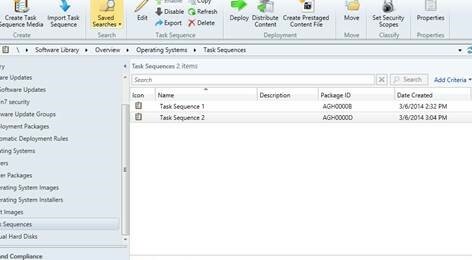 In SCCM 2007 if you advertise multiple OSD task sequences to a collection, we can select the required task sequences in Win PE boot mode. This helps us to select required windows version when installing (Ex -Windows 7 32bit or 64bit). 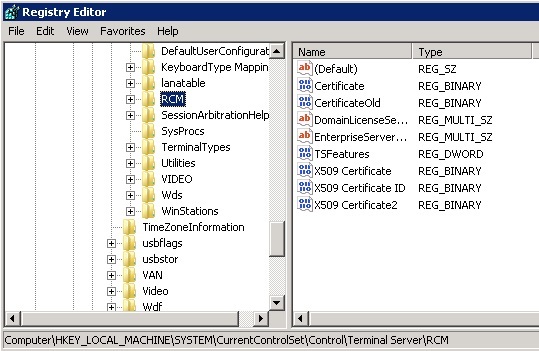 But in SCCM 2012 R2 this is rather different. We have to do few changes and these changes are really make some sense. Good thinking by Microsoft. 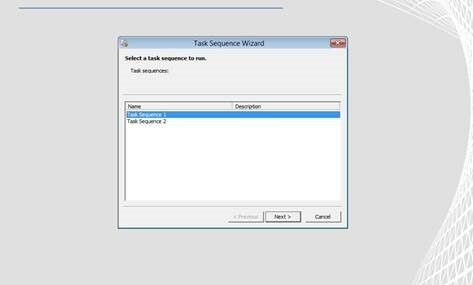 This can be built in task sequence or custom task sequence. 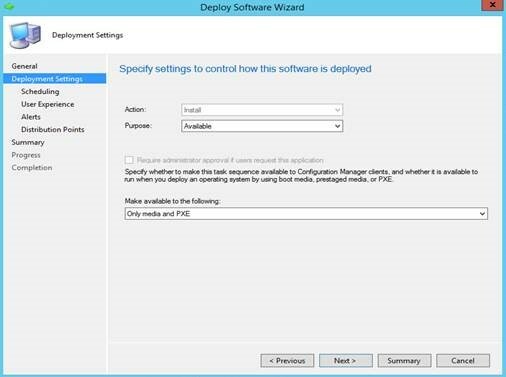 Deploy the Task Sequence, when deploying select available in purpose. When client start the network boot, you are required to press F12. If F12 is not pressed Client computer will go to the next boot device and boot. This make sense because this Task sequence is deployed as available not required. so when windows PE boots, the multiple task sequences will be desplyed and you can select the required task sequence. These new changes are really valuable, using these we can deploy the OS upgrade or OS deployments to every computer, and because the F12 press requirement to deploy the task sequence, normal Client boot up will not be interrupted. Also we can deploy multiple task sequences to different Operating system versions. These are small things but might give high impact on automation. 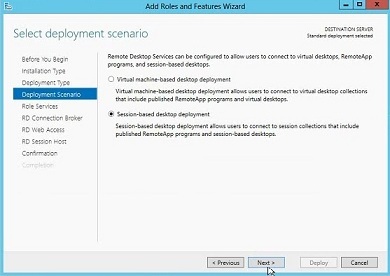 Recently I have faced a Problem that all of the Windows Server 2003 Clients cannot Remote Desktop to Windows server 2012 Session host server. They have prompted with following error. I have two Windows server 2012 session host servers and this issue only occur to one of the servers. I have tried to solve this by adding different settings that have suggested in blogs and articles but nothing helps. After getting Microsoft support, they have suggest a solution that helps to resolve the issue. Please use following steps to resolve this issue. If the issue is on this, deleting these registry entries will make windows server 2003 clients successfully login to windows server 2012 session hosts. In my previous post I have described how to create high available connection broker set up. But that setup depend on one SQL server, so SQL server became single point of failure. 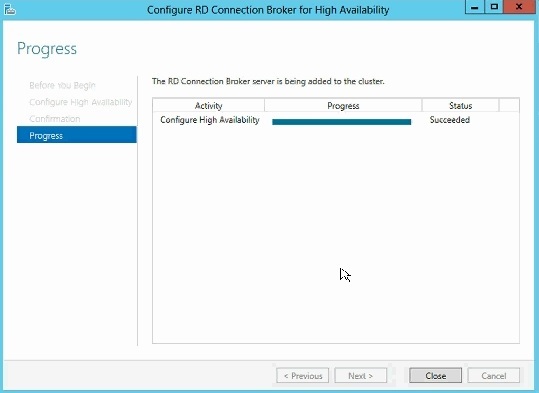 To address this I have checked HA for SQL server and found SQL server mirror is supported with RD broker HA. I have implemented this in test and production environment and its works really fine. Install the same SQL server version in the new server, use the same accounts as in mirror server. Witness server – this is for automatic fail over purpose. It can be another SQL server or Install SQL Express version on a server. No need of a dedicated server this can be a server that uses for other purpose. Added firewall exceptions to all SQL servers. 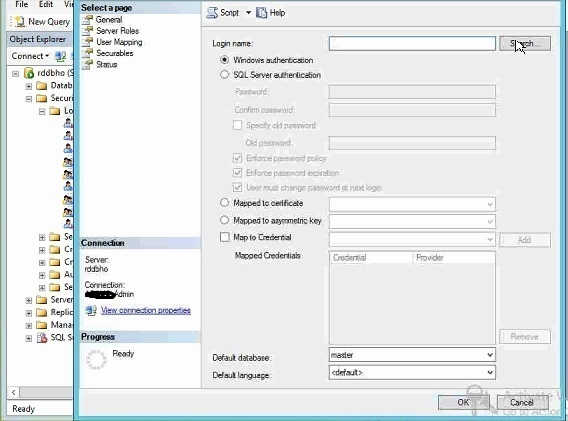 Login to principle SQL server and connect to mirror database and witness database server from that management consol. 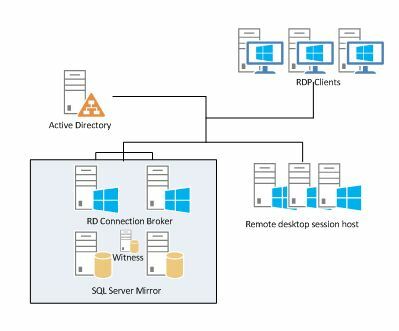 Perform this step to identify the connectivity to all principle, witness and mirror database servers. Change the principle server’s RD database to full recovery mode. Please refer the technet article, I’m just only giving the steps that you have to perform. Note – all SQL servers SQL service should run as a domain user. And check in mirror server side, Database should have sysadmin, owner, public right to the security group of RD brokers. Expand Databases, and select the database to be mirrored. Right-click the database, select Tasks, and then click Mirror. This opens the Mirroring Page of the Database Properties dialog box. 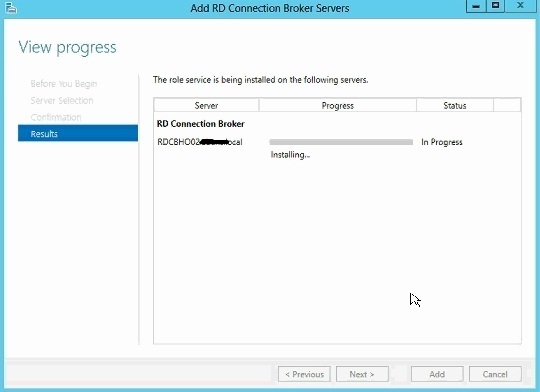 Step 02 – Configure RD brokers to support SQL mirror. 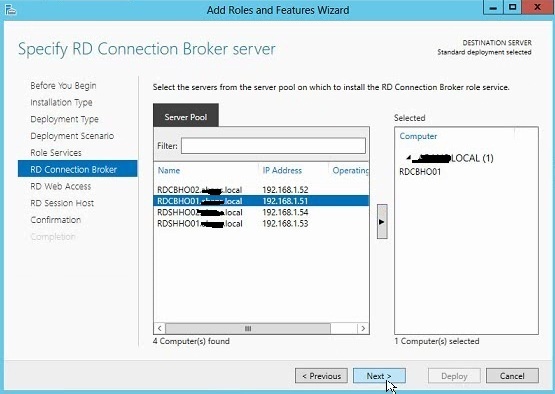 When configuring HA broker you have to provide the Database connection string, this connection string is configured to point to the RD database and its SQL server. Please refer the previous blog post on this. But to support SQL mirror this connection string have to be changed. And it cannot edit in GUI mode, only PowerShell support this. Login to a Broker server and open PowerShell in run as a administrator. If the command succeeds, confirm it in GUI mode. To test the configurations, fail over the principle database to mirror using SQL management consol. 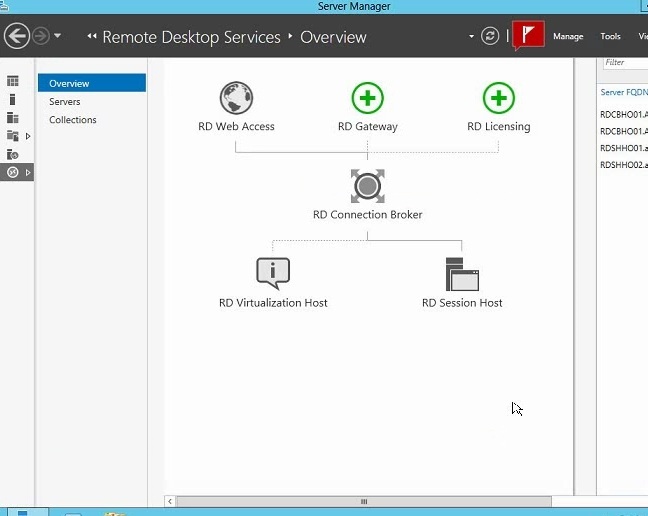 And refresh the connections from Server manager – Remote desktop services- collections – connections and refresh. If mirror successful this connection remain as same. J. If connections are empty, that means broker servers are not connecting to the mirror server database, most common problem is database security in mirror server. So check all brokers have full access to the mirror database and mirror database saved folder. Hope this is helpful, cheers. 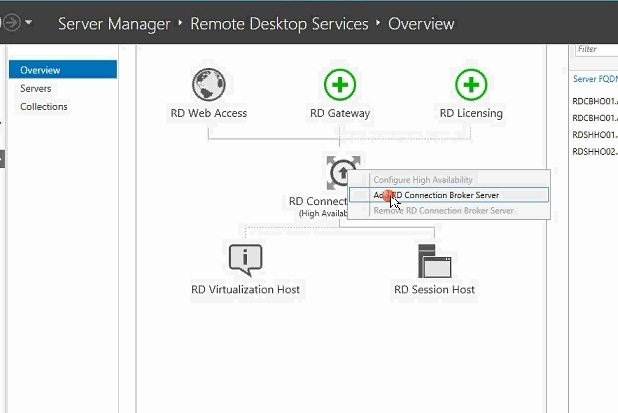 Remote Desktop Connection Broker (RD Connection Broker), formerly TS Session Broker, supports session load balancing and session reconnection in a load-balanced RD Session Host server farm. 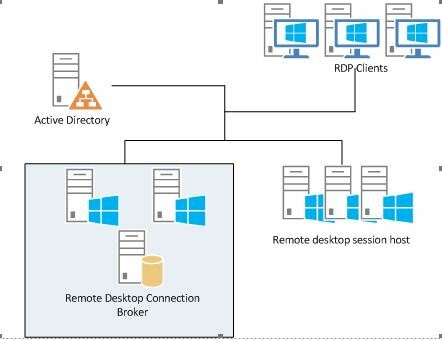 RD Connection Broker is also used to provide users access to RemoteApp programs and virtual desktops through RemoteApp and Desktop Connection. 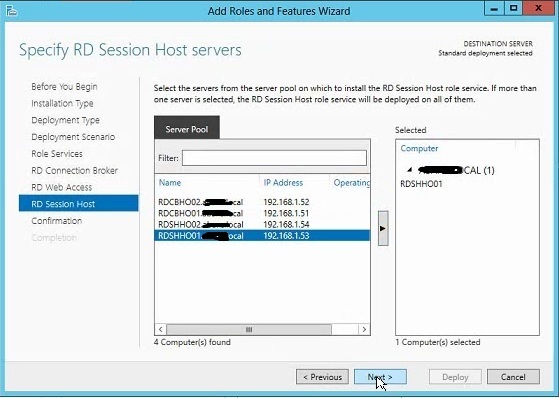 If the RD Connection Broker Load Balancing feature is enabled, RD Connection Broker also tracks the number of user sessions on each RD Session Host server in the farm, and redirects users who do not have an existing session to the server with the fewest sessions. This functionality enables you to evenly distribute the session load between servers in a load-balanced RD Session Host server farm. Download and install SQL native client on all connection broker servers. RD broker server have full permission to the SQL database and SQL installation folder. Minimum one server required as session host server. Firewall exemptions for SQL server should be defined before the implementations. Create a Security Group in the DC and add both Connection Broker servers to it. 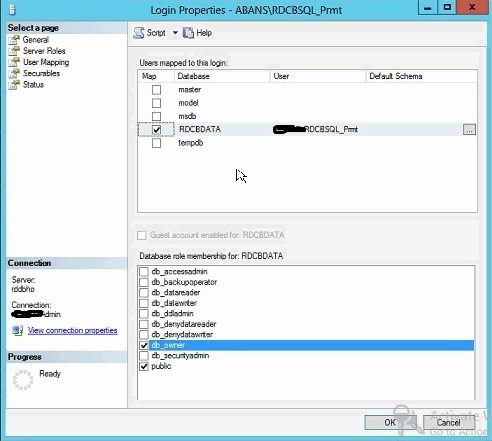 Create a folder in SQL server, both RD connection brokers servers should be have access to this folder, add the previously created security group to the folder security permissions and provide full access. This is where the database should be saved and both RD broker servers should have access to it. Install SQL native client on both RD connection broker servers. If your SQL server is SQL server 2008 R2 then use SQL native client 10 and if its SQL server 2012, use SQL Native client 11. Use previously created security group and give this group sysadmin, full permission to the SQL Server by using SQL Server Management Studio’s “Security” configuration. Right click the connection broker and select connection broker high availability. The connection string to the SQL database containing the name of the database to be created for the RD Connection Broker server. 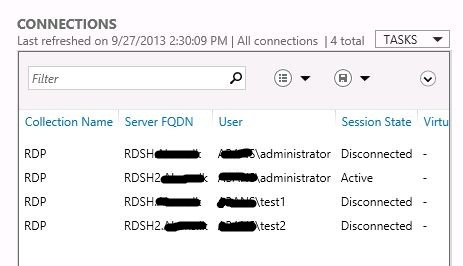 This is the string that RD Connection Broker servers will use to connect to the RD Connection Broker database on the SQL Server. Open SQL server manager in database server, the RD database is now created. Go to the security tab, Select the security group that previously added– right click properties, set default database as RDS database, and go to user mapping – tick the RD database and tick db_owner, public. This is the exact method that you can High available the RD connection broker servers. 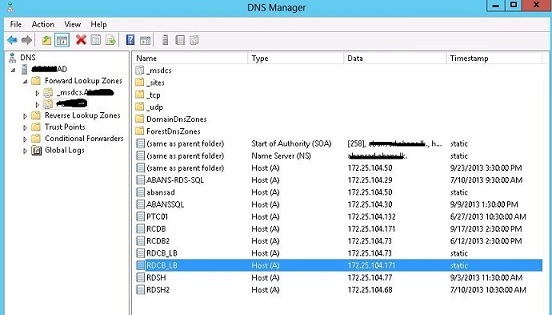 Now you can check this by using RD connection to Connection broker round robin DNS name. 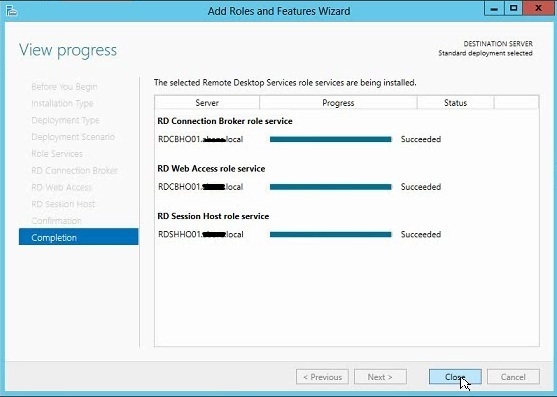 You can check the high availability by shutting down a one server or set active connection broker from remote desktop overview. 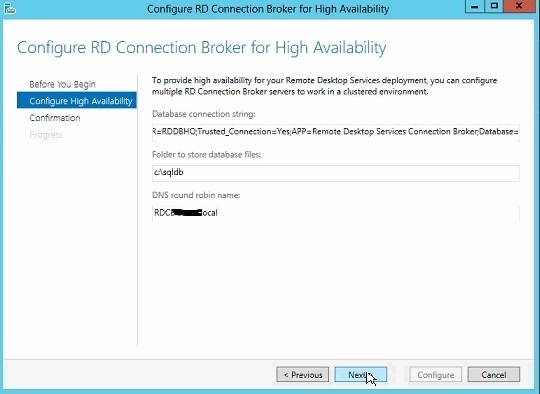 This article is only cover how to high available RD connection broker in windows server 2012 using one SQL server. But this scenario SQL server is became a single point of failure. So on my next blog post I will cover how to high available SQL server for RD broker using SQL mirroring. 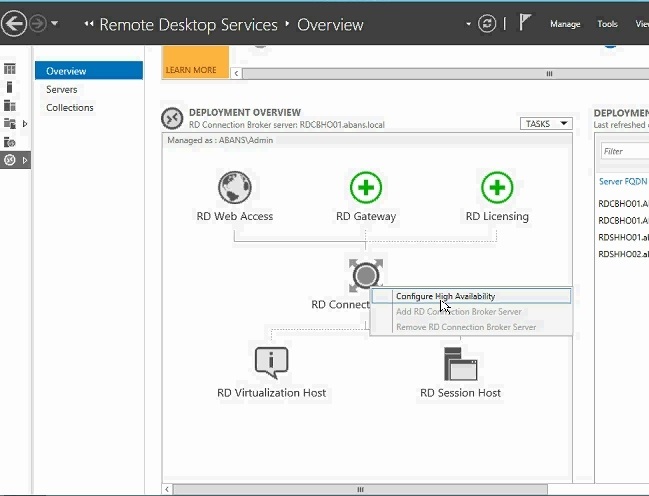 Please create session collection and other configurations (User group adding to remote desktop security group) before use this setup because its only cover the RD broker HA.